Sterling Silver Stewing Beef $3.99 lb Sale Price $4.80 Savings Hand cut in store. Boneless, value pack, cut from Canada AAA grade beef, $8.80 kg.Compliments Black Forest or Honey Ham $1.00 100 g Sale Price $0.99 Savings Deli served. Jumbo Red, Green or Black Seedless Grapes $1.99 lb Sale Price Up to $2.00 Savings Product of USA, no. 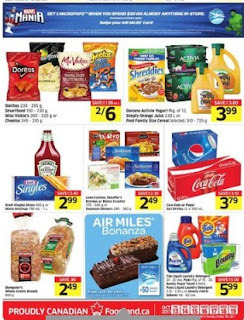 1, $4.39 kg.Apio Sweet Kale Salads $2.99 Sale Price $3.00 Savings Product of USA selected, 255 - 340 g.Doritos Smartfood Miss Vickie's Cheetos 2 $6.00 Sale Price Up to $1.98 Savings Doritos 230 - 255 g, smartfood 150 - 220 g, miss vickie's 200 - 220 g or cheetos 245 - 310 g.Danone Activia Yogurt Simply Orange Juice Post Family Size Cereal $3.99 Sale Price Up to $3.80 Savings Danone activia yogurt pkg. of 12, simply orange juice 2.63 L or post family size cereal selected, 510 - 725 g.
Kraft Singles Sliced or Heinz Ketchup $2.99 Sale Price Up to $3.40 Savings Kraft singles sliced 450 g or heinz ketchup 750 ml - 1 L.Leon Cuisine, Stouffer's Entrees or Bistro Crustini Swanson Dinners $2.49 Sale Price Up to $2.30 Savings Leon cuisine, stouffer's entrees or bistro crustini 170 - 340 g or swanson dinners 280-383 g.Coca-Cola or Pepsi Soft Drinks $3.79 Sale Price Up to $3.10 Savings 12 x 355 ml.Dempster's Whole Grains Breads $2.49 Sale Price $0.80 Savings 600 g. Triple Layer Bar Cakes $7.99 Sale Price Selected, 410 - 510 g. Buy 1 get air miles +50 bonus miles. Tide Liquid Laundry Detergent Pods Bounty Paper Towel Purex Liquid Laundry Detergent or Downy Fabric Softener $5.99 Sale Price Up to $5.50 Savings Tide liquid laundry detergent 24 - 32 use, pods pkg, of 15 - 20, bounty paper towel 6 rolls, purex liquid laundry detergent 2.26 - 2.95 L or downy fabric softener 48 - 60 use.Pumpkins $3.99 Sale Price Product of Ontario. Red Mangoes or Pre-Ripened Avocados $1.79 Sale Price Product of Mexico. Green or Golden Kiwi Fruit $2.99 Sale Price Foodland Flyer Product of Chile, 454 - 600 g.
Compliments Apple Cider Mulled Sweet Apple Cider $3.99 Sale Price Compliments apple cider 3 Lmulled sweet apple cider 2 L.Tomato and Cucumber Salad with Feta $4.49 lb Sale Price Prepared daily. $9.90 kg.Organic Lemons 4 $5.00 Sale Price Proudly organic. Product of South Africa. Pretty in Pink Bouquet in Pink Tones $9.99 Sale Price If there is a difference between the flyer and this popup, the flyer is considered correctPhalaenopsis Orchids $14.99 Sale Price 5" pot. Fair Trade Rose Bouquet In Pink Tones $11.99 Sale Price One dozen.